With best-in-class, productivity boosting, full-throttle throughput, produce vivid color plastic cards on demand fast—thanks to Zebra's highly advanced ZXP Series 8 retransfer card printer and its patent-pending image transfer process. Yet even at unparalleled print speeds, the printer achieves superior, photo-like image quality that boasts rich, consistent colors and strikingly sharp resolution. The ZXP Series 8 includes ZMotif™ XML-based software for easy integration with enterprise applications. A modular design gives you the flexibility to add a variety of encoding options as needed. 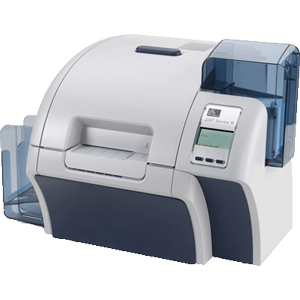 And the printer's high reliability minimizes maintenance needs and total cost of ownership. Best-in-class throughput for printing, encoding and laminating—due in part to the patent-pending simultaneous 2-sided retransfer process plus efficient landscape print mode—increases your operational efficiency without sacrificing quality. Laminator module option for single- or dualsided lamination. ZXP Toolbox provides advanced control over printer, driver, and software setup; administration; and diagnostics. Print one or both sides with high-quality, consistent, color or monochrome images for a variety of applications including ID and access control cards, security cards, membership and student cards.